The Jacksonville Jaguars opened the 1998 NFL season in Chicago against the Bears on September 6. Much was expected of the Jaguars, who were coming off of an injury-plagued year in 1997 but had nevertheless compiled an 11-5 record to place second in the AFC Central and reach the playoffs for the second straight season. Rigorous Tom Coughlin had been the head coach since Jacksonville entered the NFL as a 1995 expansion franchise, quickly turning the team into a contender. 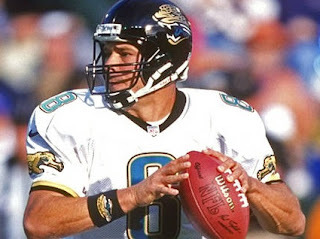 QB Mark Brunell (pictured above) was less mobile in ’97 due to a knee injury but remained a formidable left-handed passer, and he had an excellent pass receiving tandem in wide receivers Jimmy Smith and Keenan McCardell. 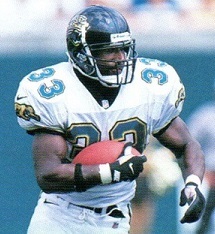 RB Fred Taylor had been chosen in the first round of the ’98 NFL draft although RB James Stewart, an original member of the team, was starting in the opening week. Chicago, coached by Dave Wannstedt for the sixth year, was coming off of a 4-12 record the previous year. Erik Kramer was again the starting quarterback and RB Curtis Enis was taken with the fifth overall pick in the first round in an effort to bolster the running game, although he missed nearly all of training camp due to a contract holdout. 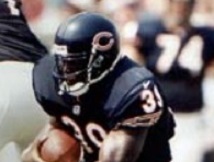 Veteran RB Edgar Bennett, who had spent the previous five years with Green Bay, was also added to the roster. It was hoped that deep-threat WR Curtis Conway was healthy and would have an impact after missing nine games due to a broken collarbone. Moreover, there was much fan discontent with a club that had not reached the playoffs in four years. There were 55,614 of those fans in attendance at Soldier Field on an 80-degree day. The teams traded punts before RB Tavian Banks of the Jaguars fumbled after catching a pass and the Bears recovered at the Jacksonville 37. The turnover led to the game’s first points as Jeff Jaeger kicked a 45-yard field goal. In response, the Jaguars put together a long drive that included five completions by Mark Brunell. The first was to Jimmy Smith for 13 yards and Keenan McCardell had a 21-yard reception to the Chicago 46. Brunell converted a third-and-six situation with an eight-yard run and when he connected with McCardell again for nine yards, the visitors had a first-and-goal at the nine. But on the first play of the second quarter, Brunell threw a pass intended for Smith that was intercepted by CB Tom Carter to extinguish the threat. On their next possession following a punt by the Bears, the Jaguars again moved effectively and this time didn’t fail to score. Brunell completed two passes to Smith and James Stewart (pictured at right) had a 30-yard carry around left end. The eight-play, 66-yard drive concluded with Stewart catching a toss from Brunell for a three-yard touchdown. Mike Hollis added the extra point and Jacksonville was in front by 7-3. The lead didn’t last long, however, when RB Glyn Milburn returned the ensuing kickoff 88 yards for a TD. Jaeger’s point after had the Bears back on top by three points. Short possessions by both offenses had the clubs trading punts until, with less than three minutes remaining in the first half, the Bears got the ball back at the Jacksonville 41 following another interception, this time by LB Barry Minter. Largely keeping the ball on the ground, Chicago advanced to the 16 in eight plays before Jaeger booted a 35-yard field goal with seven seconds left on the clock. The Bears took a 13-7 lead into halftime. The home team had the first possession in the third quarter and, in a series that was highlighted by a pass from Erik Kramer to TE Ryan Wetnight for 30 yards, reached the Jacksonville 23, but Jaeger missed a 42-yard field goal attempt. The teams traded punts until RB Ty Hallock of the Bears fumbled and LB Bryan Schwartz recovered at the Chicago 27. Following a three-yard run by Stewart, Brunell gained 17 yards on two carries and Stewart went seven yards for a TD. Hollis converted and Jacksonville was again in front by 14-13. Once again the Bears turned the ball over on a fumble, this time by WR Bobby Engram after a pass reception, and the Jaguars had possession at the Chicago 32. Brunell passed to Smith for 20 yards and Stewart had a 16-yard run to set up a Hollis field goal from 23 yards early in the fourth quarter. The Bears fought back with their next possession, advancing 72 yards. Kramer completed two passes and Curtis Enis had a 29-yard run among his three carries. Edgar Bennett gained the final yard for a TD and Jaeger’s PAT once again had Chicago on top by three points at 20-17. A three-and-out series by the Jaguars led to a punt and the home team again moved effectively, featuring Enis runs of 14 and 13 yards and a Kramer pass to Engram for 21 yards on a third-and-three play to give the Bears first-and-goal at the Jacksonville four. However, two runs were followed by an incomplete pass and Chicago was forced to settle for a 19-yard Jaeger field goal. Down by six points with 4:08 to play, the Jaguars started off their next possession after the kickoff at their own 13. Brunell threw to RB Daimon Shelton for eight yards and Jimmy Smith for seven. After a running play gained nothing, Brunell completed a total of six more passes, three of them to McCardell for 28 yards and the last to Smith for a four-yard touchdown. Having gone 87 yards in 13 plays to tie the score, Hollis added the all-important extra point and the Jaguars were up by one with 29 seconds left to play. Time ran out on the Bears at the Jacksonville 43 and the Jaguars came away with a 24-23 win. Jacksonville led in total yards (367 to 321) and first downs (21 to 16). The Jaguars also converted half of their third downs (7 of 14) while Chicago was successful on five of 13. However, the visitors also turned the ball over three times to two suffered by the Bears. Mark Brunell completed 22 of 35 passes for 207 yards and two touchdowns, giving up two interceptions, and was 8 of 9 for 73 yards during the climactic scoring drive. He also ran for 43 yards on six carries. James Stewart rushed for 115 yards on 26 attempts that included a TD. Jimmy Smith had 9 pass receptions for 90 yards and a touchdown and Keenan McCardell contributed 7 catches for 72 yards. For the Bears, Erik Kramer was successful on 16 of 27 throws for 189 yards and no TDs, although also had none intercepted. Curtis Enis (pictured at left) performed well in his regular season NFL debut with 77 yards on 12 rushing attempts. Edgar Bennett added 30 yards and a touchdown on 13 carries. Curtis Conway topped the receivers with 6 receptions for 91 yards. The Jaguars won consistently enough, winning their first five games and going on to another 11-5 record that placed them first in the AFC Central. They won in the Wild Card playoff round before falling to the Jets at the Divisional level. After nearly pulling off an opening-week upset, Chicago lost its next three contests and ended up once again at 4-12 and last in the NFC Central. As a footnote, neither running back that topped the Jaguars and Bears in rushing in Week 1 went on to have a big season. James Stewart was quickly supplanted by Fred Taylor and ended up with 217 yards on 53 carries (4.1 avg.). Curtis Enis suffered a knee injury and gained 497 yards on 133 attempts (3.7 avg. ).